In early September, Intel has finally released the long-anticipated Socket 1156. In following pursuit, Prolimatech released the bigger and better version of the Megahalems. Now it comes with extra set of fan clips for even better cooling results. It also includes the new all-in-one backplate for an easy, convenient installation on Intel Socket 775, 1156/1155,1150/1151, 1366 and 2011. 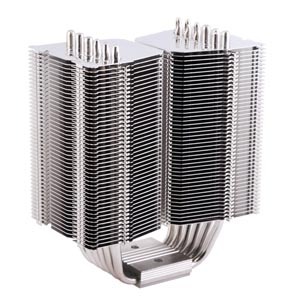 Also added to the upgrade package is the new material for the top fin on this "Mega" heatsink. This particular fin is made of all stainless steel. Its main features incorporate a greater resistance to accidental scratches and oxidation. For regular maintenance, all you have to do is lightly polish it with a soft cloth so you’ll always have that new out-of-the-box shiny looks; great for showing off at LAN parties and to your friends! Easy-to-install retention mechanism for LGA 775, 1366, 1156/1155, 1150/1151.